Almost everyone runs into this issue at least once a week, and no one ever has a solution, but Cocoweb now has the answer. How are you going to get your kayak to the beach/lake this weekend? Easily, with Cocoweb’s new EarthMount H2O - Kayak Carrier. The Kayak rack is the perfect way to get your kayak to your weekend destination, easily, quickly, and it is affordable. The EarthMount is capable of attaching to almost every standard car rack, however we do recommend using it with the EarthMount Roof Cross Rack for optimal performance (link to: 120cm | 127cm | 135cm). If you aren't using the cross rack, I would recommend using the guide provided by Cocoweb to make sure that your car is listed as one that will work. 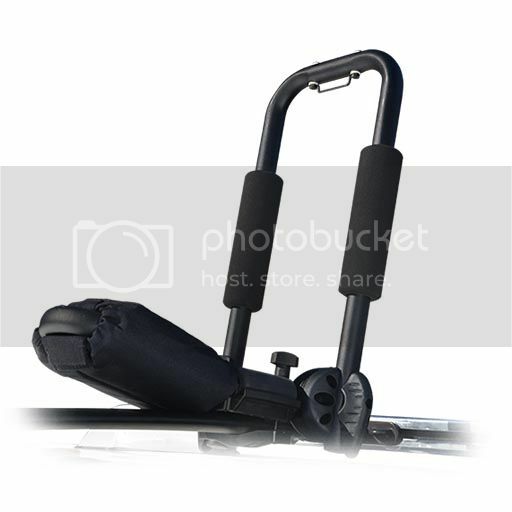 The device can be easily folded down just by the turn of a handle, making it discrete when the kayak is not on, and very convenient to save space when storing the rack. Just by holding the item you can tell a lot of planning went into this product. The design of the stainless steel frame is sturdy, and locked into place by a ring of meshing teeth. The kayak and car are both protected by a foam housing section that wraps around the bottom support bar. The Mount also has 2 sponge grips on each device, that not only protect your kayak from scratching or damage against the metal frame, but also dampens the vibrations making your drive quiet, and smooth. Each rack is equipped with a tie down rope that also has a rubber cap going over each metal latch to protect it from scratching your kayak or vehicle. The rope is inserted into a guide at the top of each frame, to ensure that it cannot move or become loose throughout your journey.